Oguro: First, I’d like to hear about how this project started. What were your thoughts when you read the novel for the first time? Ishihara: At first I thought “Whoa, this is a lot of work.” It was a great story, but I thought the actual drawing work would be a lot of trouble. Especially the SunFest marching scene. I thought “How could we convert this to video?” as I read that part. Oguro: So were you instated as the director and Yamada-san was series director from the start? Ishihara: How was it? I’ve got a feeling that’s not how it went. Yamada: More or less, we had simultaneously been asked to lead it. Oguro: Ah, so it was simultaneously. Oguro: So at first you were double-directors? Ishihara: Ah, that’s it. I remember now. When we were asked, I thought “this would be a lot of work for one person to do.” Forgive my phrasing, but I thought a helper or someone to support would be nice. I’m sure Yamada was thinking the same thing. Ishihara: Did you think it’d take a lot of energy? Yamada: There was also the question of “which one of us should be director?” For me personally, I wanted to be in a position where I would be able to concentrate and put my whole effort into making the story. As a director, you have to be concerned about everything in a production and there’s a lot of jobs outside the work itself, so it would be difficult for me to dig into the nooks and crannies of the story while doing all of that. Ishihara: Yes, but you’re also thinking “what would other directors do in this situation?” as well. Surprisingly, there’s only a few things that a TV anime director does. You work up to the storyboard check, and well, you do say “show me this cut” when each cut is completed, but that’s the limit of what you do. With that in mind, this show appeared to be one that you had to keep an eye on it to the farthest nook….wouldn’t you say? Yamada: That’d be right. This work would have a lot of parts that you wouldn’t be able to help with if you were just a director. Ishihara: You wouldn’t be able to go into details as much either. Yamada: Right. So I talked to Ishihara-san and the producers and was given the role of series director for the show. Oguro: Fundamentally, how did you divide the work? Ishihara: Yamada would look at the various detailed points. Yamada: As I looked over the entire series progression as a whole, I’d work on the subtleties of each character’s emotions and made sure that progressed logically so to speak. While I was working on that, I gradually understood the role of series director. Oguro: Did you two participate in the scenario meetings? Ishihara: Eventually she came to the recordings too. Ishihara: In the end, we said that the series director also needed to check the recording and dubbing in detail as well. Yamada: It was a happy mistake. (laughs) Also, I made sure that I didn’t go into too much detail. Oguro: Go into too much detail? Yamada: So that the bigger points weren’t lost kinda thing. Ishihara: No, no. (laughs) You could already do that. Yamada: Right. (laughs) As I would check over the details, I made sure to keep the big story in mind. If you look at the division, Ishihara-san would be the conductor waving the baton around. 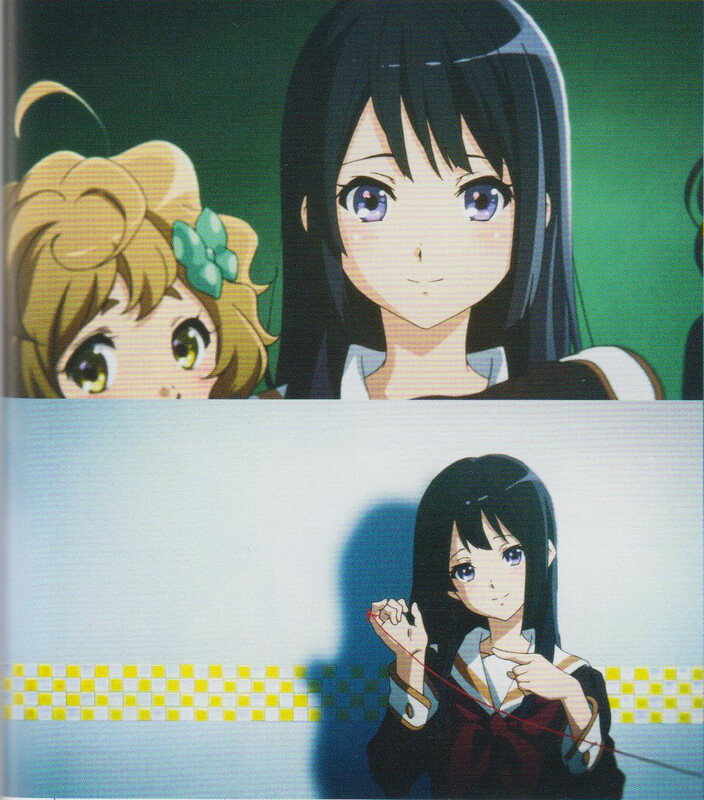 Kumiko at the beginning of the first episode and Hazuki in the classroom in that same episode. Though the latter seems like a nonchalant cut, the background has a bokeh inserted. Oguro: Were there lots of parts that you left up to each episode’s director as well? Ishihara: Yes. KyoAni’s line, or rather it should be our company’s stance on that is like that. For our works, the director decides big things like “we’ll do it this kind of way” or “we’ll use these types of colors” and then the rest is left to each episode director. And then we thoroughly check as well to make sure nothing goes way off track. Yamada: That also goes for our photography techniques too. Of course sometimes there’s times where the storyboarder wants to do a scene differently too. For example, if I want to add “lens like this” during storyboard checking, and if that technique doesn’t agree with the person who drew the storyboards, then essentially we made a sword that won’t cut. Oguro: So if, while you’re checking the storyboards, you add a photography technique that doesn’t match what the episode director drew, it becomes something flamboyant instead, right? Yamada: That’s right. That’s why we don’t add something that would disrupt the meaning of what the storyboards were to convey. Each episode director has through about how best to attach meaning to each scene while they were working on the storyboards. That’s why we have episodes that don’t have many effects as well. Perhaps it might be better to say that each director has their own way of showing things. Oguro: I understand. Then, do you take for granted that the imagery would be inflexible? Ishihara: We decided that for Sound! Euphonium. Yamada: Right. We talked with the director of photography about what kind of image to make. Our director of photography is great at making pseudo-lenses, so this production had a high synchro rate. Ishihara: Yep, (Kazuya) Takao-kun’s senses are awfully good. Yamada: I think so. He added more ways to express than we’ve used before. Ogura: Sound! Euphonium has quite the unique imagery. While the foundation is “making screens that are aware of the lens” you could furthermore say it’s “a world with a shallow depth of field.” There’s a lot of cuts that probably wouldn’t have a more modern camera; instead there’s a dense, rich flavor like older cameras have. I thought “Ah, so TV anime could go this far now…” when looking at the through processing. Why did you decide to go with that kind of imagery? Ishihara: It’s true. Well, more or less all of our previous works have had these to an extent. To begin with, the digital cameras and the video that’s shown on TV are too pretty. At least I think it’s too pretty; I wonder if perhaps it’s actually “not real” at all. The resolution has become so high that you’re looking at a world that’s clearer than what we live everyday. Oguro: In short, it’s too clear? Ishihara: Right. I think it’s too clear. So instead, I wanted to limit the screen so that you get the impression of people that we see or the scenery we remember. In order to do that, we added bokeh to the surroundings, and used older lenses in photography to get that screen. I think that’s more realistic. For example, while younger people have adapted to the digital cameras or toy cameras, a few years ago film cameras like the Russian LOMO were popular. I thought using bokeh like those pictures had would add a realistic and cool feeling. In particular with this work, I wanted to go in a realistic direction. Since I wanted it to be a real high school drama, I felt that we should create imagery that thoroughly felt that same kind of realism. Oguro: So was that planned from the very early stages of development? Ishihara: It was planned from the beginning. 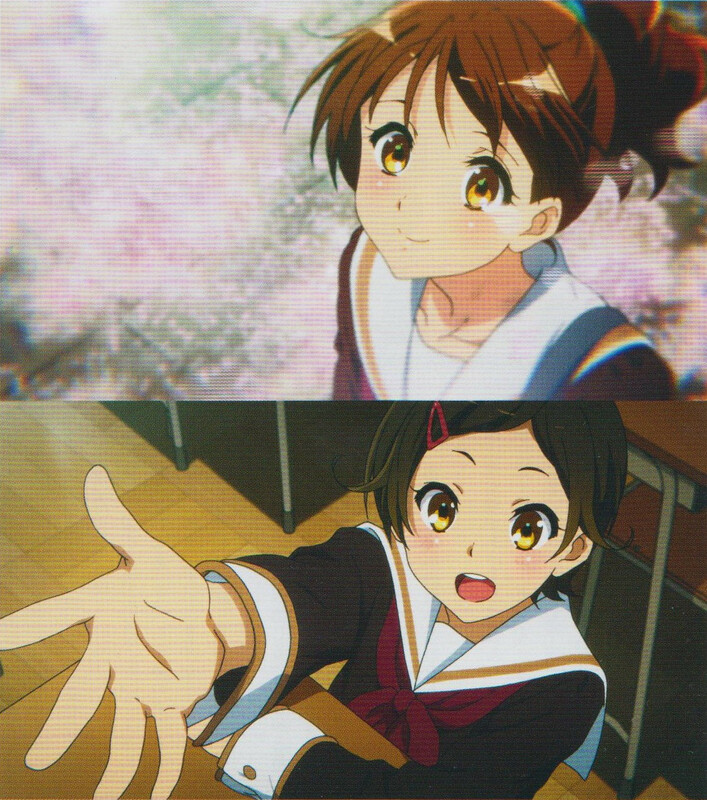 “We want to do this (in Euphonium).” In our past works, we’ve instructed “BG should be bokeh”, but for this time, we said “use a dirty bokeh.” Recent digital cameras and reflexive cameras can produce a bokeh, so lenses have become better used. We can even use those different types of bokeh, like the newer ones similar to the “two line bokeh” that you couldn’t use in older cameras, in our photography. I requested to use those types of lenses. Also I’m sure we somewhat degraded the intensity of the surrounding areas too. Yamada: That’s right. When we degraded the intensity, we also inserted chromatic aberrations. Now that I think about it, Ishihara-san and I have similar lens awareness… or, sorry to sound so grandiose, but our desires when creating imagery aren’t that far apart. But recently, I’ve noticed that our way of using screens is different. Yamada: Ishihara-san wants to make something visually stylish. Yamada: Yep, it feels like you want to use things stylishly. Ishihara: No, I don’t think they’re stylish at all. 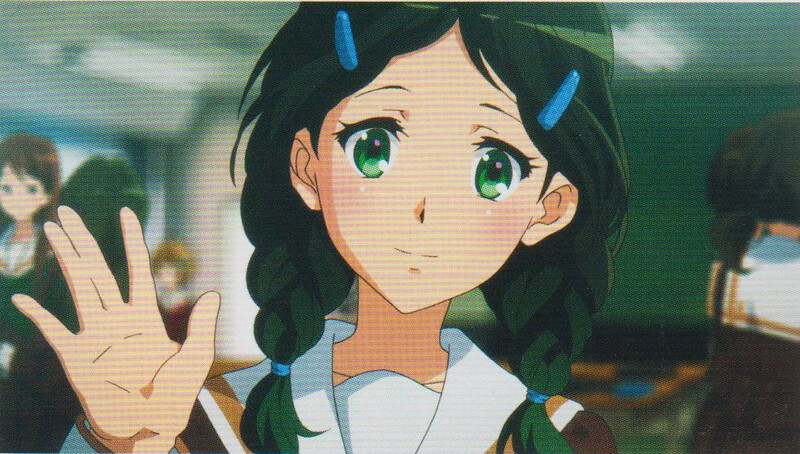 Aoi Saitou in episode 2. The revival of the two line bokeh may have appeared from the very beginning of this work. Ishihara: Doesn’t it feel like I’m more “boheh” in my use of cameras? Yamada: That might be so, but I understand it as a way of showing things in a more “cool” way. From the viewer standpoint, it’s awfully cool. Yamada: Yes. And for me, I don’t try to attach that coolness. Instead, I find a more roundness like an afternoon nap type of feeling to be better…perhaps I don’t know how to say it. (laughs) That’s the feeling that it produces. Ishihara: Ah. This may be a simple way that I understood it, but it’s like how I like wide-angle lenses and you like telephoto lenses? Yamada: I love telephoto lenses. Ishihara: Well, I guess there are some kinds of differences like that. Yamada: Also, I really love lenses like the kind of bottom of a milk jug. Ishihara: But I don’t dislike those? Yamada: That’s right…. Well, even though our likes are similar, our directorial approaches are different. Yamada: Well….. Ishihara-san is kinda…. Cool. Oguro: (laughs) The story’s come full circle! Ishihara: I don’t think my own style is very cool. I use a lot of wide angles and place my cameras a bit carelessly. Yamada: But those wide angles are definitely cool. Ishihara: Is that so? Maybe they become cool at a distance. Yamada: Looking at a distance is cool! Yamada: But either way, it becomes something that subconsciously entertains the viewer. Oguro: By “subconsciously entertains” you mean something the viewer can feel that they can’t put into words? Yamada: That’s right. The scene by the sakura trees on the morning of the entrance ceremony was like that too. A bit printish, and furthermore a filthy lens was attached to make that visual. Oguro: It looks like a feminine camera, doesn’t it? Ishihara: Ah, you mean the camera that girls use now. Ishihara: I used that as reference too. When I say “make it like this” and show a reference. It’s like an image from a toy camera or one of the more recent stylish cameras. Yamada: Ishihara-san has a lot of reference books. Ishihara: Ah, well I do. I don’t dislike photography. Oguro: Don’t they feel radical? Ishihara: In comparison, I like American films of the 1970s, so perhaps I may use that imagery. Oguro: So to say it, you to pattern your imagery from live action films of the past? Oguro: I wonder if that specifically comes out strongly in Euphonium. Ishihara: Well, it’s that kind of thing right? I don’t have that kind of sense though. Well, perhaps that’s the difference between a director and series director. Before/After of Sound! 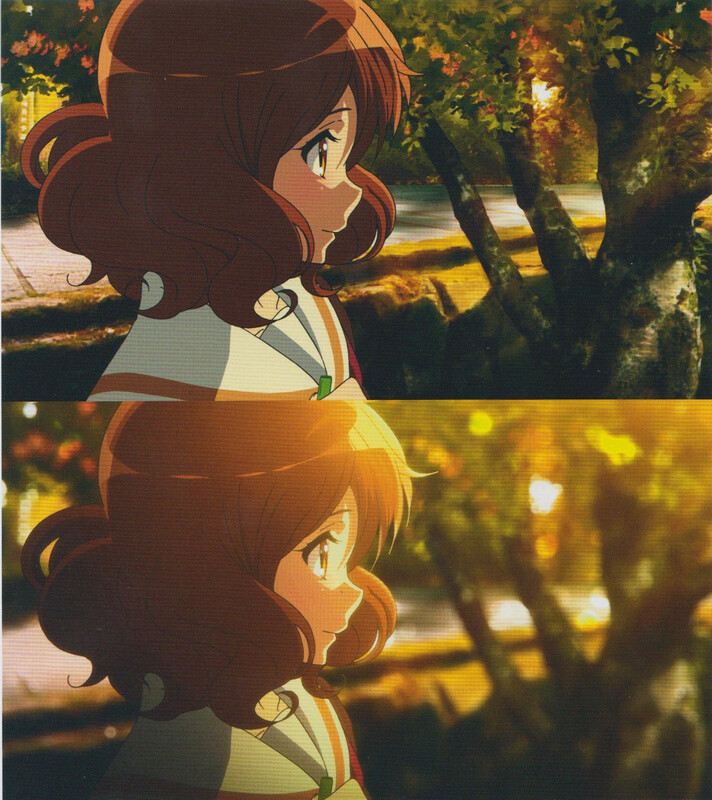 Euphonium’s photography: The top are the raw materials before the photography effects are added. The bottom is the complete image with them added. Light is added, the background becomes blurred, and it reflects the twilight atmosphere. A sense of realism is added and the characters’ emotions are more strongly brought out. Ishihara: For this work, the “female point of view” from our women directors was immensely strong. Oguro: Was that in the visual aspect? Or perhaps in the dramatic aspect? Ishihara: The visual aspect. There’s lots of things that we call “manly” or “feminine” that women dislike, but women are better at character relationships and how to treat characters’ mental states. At least the impression that they’re more fixated on it exists. Men would put more effort into cool camera work but I get the feeling that women would treat the character connections and relationships as more important. So it’s there that we could rely on them. Oguro: So in dedicating how to frame the characters and how to compose the image as a whole, right? Ishihara: Those kinds of things. And also we relied on them when it came to rotating around dialogue too. Our sound director also relied on Yamada too. During our recording sessions, Yamada would read the script and be asked “does this sound adolescent to you?” She would change the dialogue at those parts that didn’t sound like something a high school girl would say. Our sound director was fixated on “high school girl reality” this time, but well, to make it short, “I’m not sure high school girls would sound that logical.” (laughs) At the scenario stage, we wrote lines that would go in logical order, but high school girls wouldn’t have the entire conversation be that thoughtout, would they? There’d be some parts where a logical connection wouldn’t exist in the entire conversation. And so we consulted Yamada for the “does this part feel that way?” portions. The easiest example I can give would be episode 9. Hazuki, who had just been rejected, is talking with Kumiko on the train and their conversation has logically progressing dialogue, but there’s some strange portions when it’s written down. I also thought “Huh? Is this alright?” when I read it; like in the part where Hazuki goes “Sorry for inviting Shuichi”, “You don’t have to say that” “I do.” I thought it was really odd, but it probably ties together the whole conversation. Oguro: So Yamada-san would be the judge for those kinds of exchanges? Oguro: Please tell me how she rebuked her. Yamada: Even if the information that you want to put in is present, that doesn’t mean that you can create a conversation that doesn’t go according to reason. I made sure to make these conversations have a certain reasoning to them even if they didn’t proceed logically…. Ishihara: Right, right, that kind of thing. Ishihara: I didn’t think they fit properly. 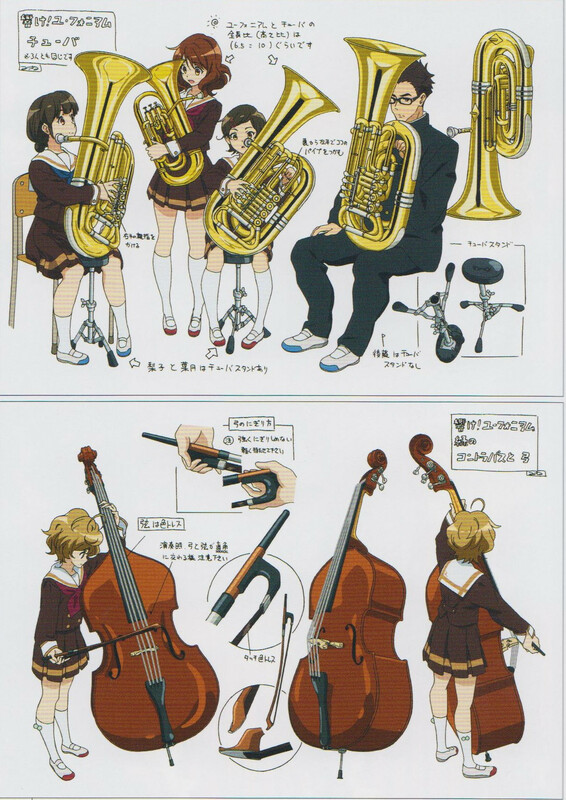 The instrument designs that Hiroyuki Takahashi designed for Kumiko’s euphonium and Reina’s trumpet. 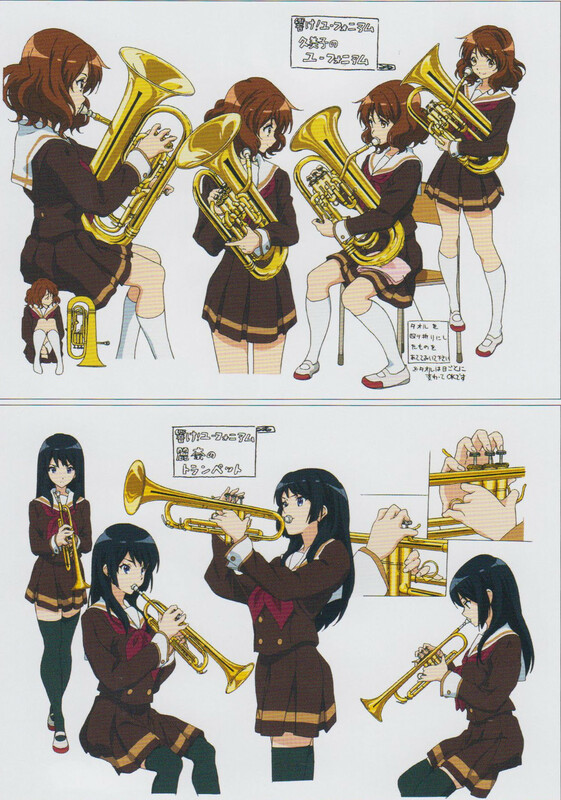 Kumiko puts a quarter-folded towel between the euphonium and her leg. Oguro: Yamada-san, you mentioned earlier about “depictions that were better than you’ve done before.” Could you give an example of that? Yamada: It’s those kinds of technical portions like “use a dirty bokeh” or “use something telephoto-ish” that were better depicted than before. Ishihara: Camera shaking is useless unless you research it more though. Yamada: I’ve gotten better at that! Ishihara: Ah, is that so? Oguro: Camera shaking, it’s like when someone is physically shaking the camera, right? Ishihara: Right. It’s surprisingly difficult. Yamada: I’ve used it before, but I think it turned out much better this time. Oguro: What plans did you have to present something with camera shaking? Oguro: Ah, so it was showing their emotional state moving? Ishihara: For me, rather than show emotional movement or a sense or realism, I wanted to have the viewer feel like their ability to see that person was really being shaken. Yamada: That’s right. There’s a lot of layers that are added onto one depiction, so it’s really difficult to summarize it into one description. Oguro: It wasn’t just camera shaking; there were other techniques that you used and other lenses added that made it clearly feel like “this is a camera that someone’s recording video on.” In short, it’s not that “the viewer is being sucked into the world of the anime”, it’s “there’s a cameraman filming inside the anime world.” Wasn’t there a sense of danger that the viewers wouldn’t be able to emphasize with the characters if you strengthened that objective point of view? Ishihara: Well, I could see that. Well, we instruct that it should be entertaining. There’s a lot of times where I used camera shaking to reflect Kumiko’s point of view. Yamada: I got a feeling maybe it was to improve her presence or maybe to feel more realistic. I wanted to use these pseudo-lenses to create a “Ah, this girl could really live here” feeling. Ishihara: I mentioned it a bit ago, but I love imagery where it looks like people could really live there, so inserting camera shaking is a link to that. But of course people don’t look at the scenery around them with a variety of lenses, so there’s not a lot of need to use filters. In short, though we’re wanting to simulate that with cameras and lenses when making imagery, it’s possible to say that we’re separating it from how people see it. That’s why I think I might change my way of thinking henceforth. But I couldn’t help thinking about that when making imagery for this work. Also, I love photography and cameras, so of course I’ve been influenced by films. I’ve referenced camera work in films when playing around with depths of field.. The instrument designs that Hiroyuki Takahashi designed for Hazuki’s tuba and Sapphire’s contrabass. Sapphire’s contrabass designs also have details for the bow and how it’s held. Yamada: We were immensely pleased with the types of lens flavors and such, but there may be people who didn’t like that way of expressing the story. Perhaps it’s a problem if we suddenly blur the screen…. There may be a possibility that we had a photography mistake when we were re-doing portions as well. Oguro: That would be during production? Oguro: So you think there might be people who would say “why’d you blur the background so much? Please show it clearly!”? Yamada: Yep. I think there are people like that. Ishihara: Maybe it’ll be interesting if those kinds of scenes were done from a geezer’s point of view. Oguro: Ah, so even though children and adults see the same thing, their way of seeing it may be different, right? Ishihara: They’re likely seeing it differently. Ishihara: Also, as the lens of the eye gets muddy as you get older, the color saturation of things you see may change slightly. Yamada: I’ve heard about people seeing completely different blacks and such. Ishihara: That’s why there’s rumors about why people who’re old start wearing such flashy clothing. Oguro: Returning back to the depth of field topic, the expressed things when you pan the focus when the depth of field is very small from the inside outward helps to differentiate them. I feel like this kind of imagery is oriented towards a “making adolescent objects feel real” manner. Yamada: That’s right. Adolescence is very short sighted. It feels like their pupils have little room. Ishihara: It’s that “this feels like something you can only see now” sensation. When our subjects need to be highlighted, we’ll reduce the depth of field so that only they are in focus. But since we have a lot of characters in this show, there’s times where we can’t fit them in one frame and thus have to inevitably use a pan-focus. Generally, these are performance scenes in the music room. Yamada: There’s a certain mood inside images with pan focus too. You move from this side to the other side through the entire piece where you can’t see everything at once. When will Reina become the girl we see in the ending? There’s a cut in the ending where Reina is seen smiling. It’s an soft expression not seen in the show. For the answer to that question, stay tuned in the interview! The opening was directed/storyboarded by director Ishihara and the ending was done by Naoko Yamada. Oguro: How much did you use 3D layouts this time around? Ishihara: We used them frequently. We constructed the music room, the classroom, and the room they use to practice all in 3D. Yamada: And the hall too. We also used it during the re-audition in episode 11. Ishihara: Ah, we made the hall too. That was somewhat photographed against our wishes. Oguro: Were the desks in the classroom 3D as well? Ishihara: They were 3D, yes. Oguro: So that doesn’t mean that you traced the 3D model desks from above, right? Ishihara: They were traced. We would make a general rule of doing that, am I right? Yamada:….. Actually, we did it both ways. 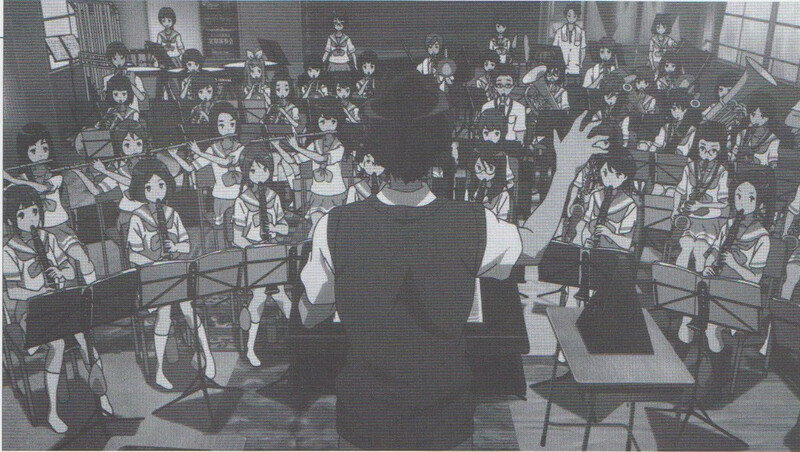 Oguro: During the scenes when the band is practicing, you have some shots from behind the conductor where everyone is in frame. For those kinds of cuts, did you use 3D for the characters too? Yamada: Yes. For that reason, we made 3D models of all the band members too. And their music stands too. Oguro: The cuts where the stands are standing is immensely dense. I looked on with admiration of them. I imagine they’d be impossible to do hand-drawn. Yamada: But they were hand-drawn in episode 1. Yamada: When you ask “is there meaning to it being drawn this way,” there is a certain meaning. While I say that, it became too immense for our resources so it became something we made with 3D. Ishihara: So though we made all the stands, we also had some points where there were variations in the stands as well. Each one had different parts. Some would stand straight and level, some would be slightly to the right. Oguro: Was that done so each person would have their own one? Ishihara: You have to keep your mouth moist during performances, so each person would keep a bottle underneath them while playing. So we made each person’s bottles individually. Ah, also the towels. Where would we put the towels? Yamada: Right, like some would put them around their shoulders. Ishihara: When you blow on an instrument, you have saliva, or steam, regardless, water gets onto the instrument, so everyone has a towel nearby. There’s variants like some put them in their laps and the percussion group wears them around their necks. Oguro: So once you decide those kinds of things, they stood the same for each character throughout the series? For example, would a character wear their towel around their neck the entire time? Ishihara: It doesn’t matter if there’s some differences inside a cut, but we decided “fundamentally, they would wear it like this” for each. Oguro: That’s an incredibly detailed design process. Ishihara: It’s huge or rather…..
Yamada: More or less drawn once. Oguro: Ah, I get it, I get it. Yamada: Those were created by the setting managers. The members in the first row and Taki were hand-drawn. The members from the second row back were 3DCG. As mentioned above, this is the first of a two part interview translation. The concluding part is here.